This kit has been relied upon by some of the most notable expeditions in the World, including the Mallory/Irvine Research Expedition and Ed Viestur's recent successful summit of Annapurna. 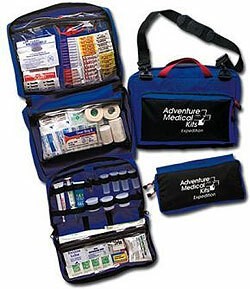 This kit includes the essentials for an adventure travel guide or mountaineer including: oral rehydration salts, diarrhea medication, water disinfection tablets, SAM splint, and enough components to care for a large group for an extended period of time. Size: 16" x 10" x 8"
20 Bandage, Adhesive, Fabric, 1" x 3"
2 Bandage, Conforming Gauze, Sterile, 3"
4 Dressing, Non-Adherent, Sterile, 3" x 4"
1 Molefoam, 5" x 6"
1 Bandage, Elastic with Velcro, 2"
1 SAMÃƒÆ’Ã¢â‚¬Å¡Ãƒâ€šÃ‚Â® Splint, 4" x 36"
1 Emergency Reflective Blanket, 60" x 96"
Developed with and used exclusively by Yosemite Mountain Guides, this kit is now available for retail sale. Ideal for any outfitter, guide, trip leader, or mountaineer who wants to go light, fast and watertight.